I got photos from our last paddling trip. It was really spooky weather conditions. 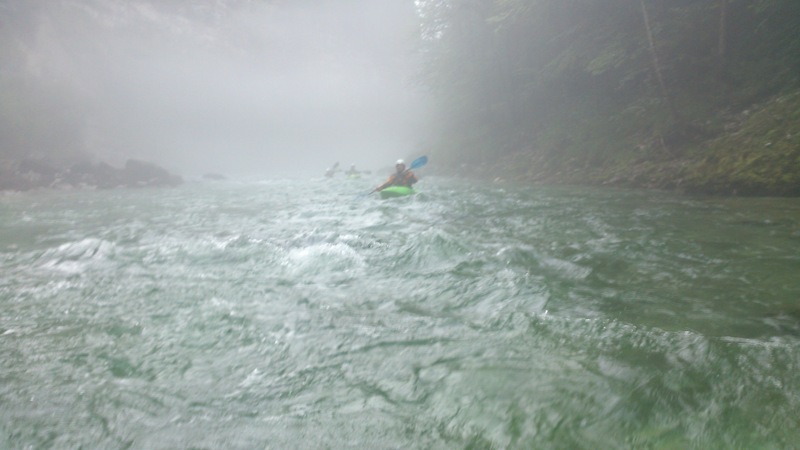 It rained a lot and later fog ascended from the white water. It was hard to see the upcoming obstacles. I once fell of the boat and crushed against a stone. My elbow is still hurting and doesn’t look too delicious. He sent them to me via e-mail. Yesterday I came home a little later, because I had an after work event with my colleagues. He prepared a movie to watch. But I really didn’t want to watch anything. I told him, but he ignored it. So I went to bed. That was it. I really would have preferred to spend time together. To talk about the day, to simply talk. And maybe be nice to each other. But he had no need for this. This entry was posted on Wednesday, August 13th, 2014 at 07:00	and tagged with communication, hobby, photo, time together and posted in everyday. You can follow any responses to this entry through the RSS 2.0 feed. « What has happened lately?